The Klipsch R5 Wireless are tiny wireless sports earbuds | What Hi-Fi? Size isn't everything but when it comes to a pair of earphones for running or in the gym, most people would probably prefer something on the smaller and lighter side. Klipsch has aimed squarely at that market with its new R5 Wireless earphones. 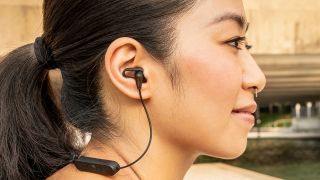 The earphones feature support for the superior aptX and AAC Bluetooth 4.2 wireless codecs, promise a decent 8 hours of battery life and are IPX4 water resistant. Promising to be the "most comfortable headphones on the planet", the R5 Wireless come with Klipsch's patented oval ear tips, Comply Ts-100 Comfort foam tips and 'ear wings' to help them stay in your ears. Compatible with most phones, Android and Apple, they feature a microphone for taking voice calls, too. The Klipsch R5 Wireless are on sale now, priced £100/$89.